On 15 Jan 2019 Canada Post issued a set of 9 stamps featuring some of that countries most stunning landscapes. The stamps are produced in booklets, horizontal and vertical coils and a souvenir sheet. Five of the stamps are permanent value stamps while the other four have specific denominations. 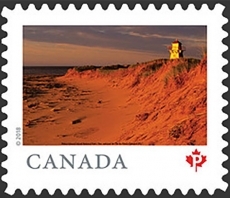 One of the permanent value stamps depicts Covehead Lighthouse in the Prince Edward Island National Park. This lighthouse was built fairly recently (1975) but its lens is over 100 years old. This entry was posted in Lighthouses, Stamps and tagged Canada. Bookmark the permalink.